While working on a small game I needed something to approximate bouncing ball behaviour. 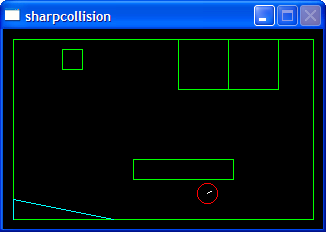 So I decided to treat it as a separate project and here comes: sharpcollision. The download package contains the library to be included in your project and also a test application to see how the whole thing works. Don’t expect this to be accurate nor finished, but it’s a good approximation of simple physich for your games. Note: integration step is not considered, so you should find your own mechanism to keep logic updated at a constant rate. This entry was posted in sharpallegro on September 22, 2009 by ElvenProgrammer.